Custom PC building has become very popular in the past years, allowing technology enthusiasts to have more freedom in their system’s capabilities. Assembling a PC also creates an exhilarating experience, and many take pride in their final build. This article will explore three basic level PC builds: an office build, an entry-level build, and a gaming build. Note that each of these builds does not include peripherals, like a mouse or a keyboard, or an operating system. Different vendors sell peripherals for different prices, and it is recommended to find suitable peripherals depending on the computer’s purpose. Many sources also offer Windows 10 for relatively cheap prices, and Microsoft has allowed users to transfer Windows licenses to new computers. The Microsoft support website can be accessed for further questions regarding Windows options. If you enjoyed this special article, make sure to comment below if you’re interested in more articles on specific types of PCs. This PC was built with a $500 CAD price tag in mind. It is designed for simple home office work, optimized for light workloads like internet browsing, movie streaming, and Microsoft Office. The CPU, the Intel Pentium G4560, is certainly powerful enough to handle most office workloads, and for a cheap price. The G4560 is also well built with integrated graphics, which means that graphics cards aren’t necessary, which would otherwise add over $300 to the build. The chosen B250M motherboard includes 2 DIMM slots which allow for future upgradability. A parametric filter is being used for the memory to choose the best 8GB kit with dual channel, at speeds above DDR4-2800. This works well with upgradability since many new PCs are looking at faster memory speeds. A filter is also applied to storage, where an SSD is recommended due to how it makes office work much faster compared to a traditional HDD. Once again, this can be upgraded to increase capacity. A MicroATX Mid Tower case by Thermaltake is also included, which includes great cable routing options and a number of hard drive bays for a relatively low cost. The EVGA 500W 80+ certified also shares similar features, low cost for decent power efficiency. The power supply allows for up to 500 watts of power, which is more than enough to allow for a smooth working environment. To finish the build, an optical drive and a Wi-Fi adapter is needed to allow for increased functionality and flexibility needed in office work. This PC was built with a $1100 CAD price tag in mind. It is designed for a decent gaming performance as well as simple office work. As the build name suggests, it is a great option for people who are just beginning their PC building adventure and are looking for opportunities to expand and upgrade their system. The CPU and motherboard, a Ryzen 5 2600 and B450 AORUS, offer a great gaming performance considering its low price compared to similar Intel counterparts. At 3.4 GHz, the Ryzen 5 can easily be overclocked using Gigabyte’s UEFI systems. Ryzen’s stock Wraith Stealth cooler also works great and is quiet compared to other coolers on the market. Storage and memory are once again on a parametric filter, for 16 GB of DDR4-3000 RAM, ensuring that this PC will last for many years. A 256GB SSD will allow for Windows 10 and other common software such as the Microsoft Office Suite, and a 1TB HDD allows the storage of large games. The graphics card is an MSI Radeon RX 580 8GB. The RX 580 is a “bang for the buck” (good value for its performance) kind of part, where it performs very well for its low price of $290 CAD. The software that AMD includes with its GPUs is also decent for recording gameplay. Lastly, a Phanteks ATX Mid case and a 550W 80+ Bronze semi-modular power supply finish off the build. Both of these items are at a great price for their value. This PC was built with some of the best parts in mind, and a $2250 CAD budget. It is designed for a great gaming experience for a reasonable price. In addition, it has many features which can be upgraded in the future. 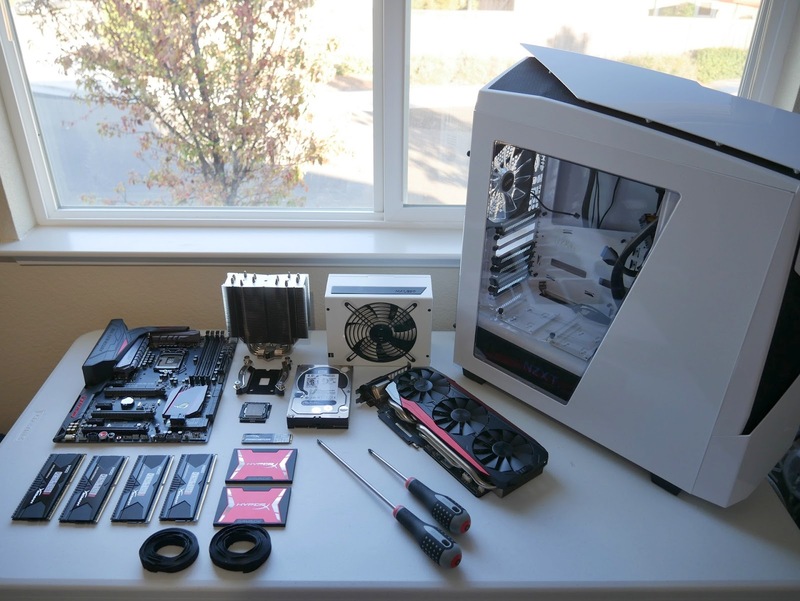 The build starts out with an Intel Core i7-9700K, a Corsair H100i liquid cooler, and an ASUS Prime Z390. Each of these parts is designed for high end gaming and streaming. The 9700K’s 8 cores allow for seamless video rendering and streaming, which is powerful enough for both recording game footage or just simple video editing. The silent but powerful functionality of an AIO liquid cooler keeps CPU temperatures low, and the ASUS motherboard allows for quick and easy overclocking and RGB sync using ASUS’ Aura Sync software. The memory remains the same as the previous build, with a 16GB kit of DDR4-3000. The motherboard’s DIMM slots allow for a memory upgrade down the road, where additional memory can be added. 16 GB is also enough to provide exceptional streaming and gaming performance. The Samsung 970 Pro M.2 SSD, one of the fastest and popular SSDs currently available, is also added. It also makes use of the motherboard’s M.2 slot. Similar to the last build, a 1.5 to 2 TB HDD is added, which is able to store games and video footage for streaming and recording. The powerhouse of this build, a Gigabyte GeForce RTX 2070 features Nvidia’s raytracing features (check out this article to learn about raytracing!) and offers some of the best performance available. The RTX 2070 is well suited for video rendering and streaming, as well as smooth and quick gameplay. Finishing off this build is the Cooler Master MasterBox Pro 5 RGB ATX Mid which sports some very useful cable management routes and RGB strips. When paired up with the Aura Sync software and external RGB strips, allow for full customizability of RGB LEDs. There is also an 850 W 8+ gold EVGA power supply, which is more than enough to handle the parts and any overclocking features. Image Credit: ASUStek Computer Inc.
Take a glass. Turn on the tap. There it is: safe, clean drinking water right at your disposal. It travels through thousands of kilometers of watermains, tens of thousands of valves, multiple storage tanks, reservoirs, pumping stations and treatment plants to end up in your kitchen sinks. In general, treatment plants consist of six steps, the first being a raw water settling pond, where water sits until debris naturally settles out before being pumped upwards for further treatment. This is particularly useful as a backup reserve in the case of a large irregularity in water accessibility (e.g. oil spill or algal bloom). Chemical coagulation: naturally occurring organic matter is first broken down using an oxidant. The fluid is then rapidly mixed with a coagulate (which causes fine particles to clump together). Flocculation: coagulated particles are slowly stirred to form floc. The increase in collisions from the mechanical energy applied promotes contact between the floc particles and the particulates in the water. This consequently forms larger particles which make for easier removal in the following stages. Sedimentation: the velocity of flow is reduced so gravity can remove denser particulates. Filtration: Fluid is finally passed through a granular substance to remove any remaining impurities. The general water treatment plant is not equipped to efficiently remove rapid accumulation of algae in the case of an algal bloom. These blooms are caused by toxic cyanobacteria which is not only lethal to humans but also to aquatic life, costing billions in government funded supplementary water treatment and in revenue for fishing and tourism industries. Currently, algae is detected by collecting water samples sent to certified research labs where experts view the sample under a microscope and manually count the different organisms to identify the cyanobacteria. This process takes weeks and, in some cases, even months - making active monitoring and predicting harmful blooms next to impossible. A group called Blue Lion Labs (formerly SIM Labs) is proposing a solution that allows for key stakeholders be proactive at the onset of a bloom with their goal of detecting the bacteria within minutes. It is founded by Jason Degelint, a Systems Design Ph.D student along with Dr. Chao Jin and Dr. Alexander Wong; research professors specializing in water technologies and artificial intelligence respectively at the University of Waterloo. The Blue Lions Labs team aims to achieve automated monitoring and prediction of blooms by leveraging machine learning and Spectral Integration Microscopy (SIM) to identify six different types of algae. They have essentially created a portable water monitoring system which allows for larger datasets to be analyzed on-site for significantly lower costs. The data collected can help better understand cyanobacteria behaviour and can ultimately lead to bloom predictions before they occur. They have received significant funding and successfully built a prototype of their custom microscope system, with Degelint stating in a May 2018 interview that their next step was to test the computer against human experts in the lab. Dive deeper into the inner workings of their water monitoring system HERE. 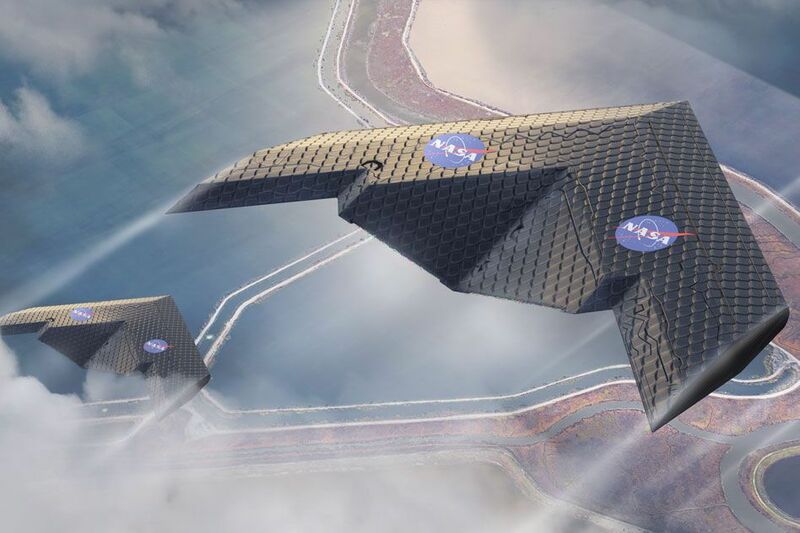 A team of engineers at NASA and MIT have created a wing composed of hundreds of tiny, identical pieces that are capable of morphing into the most efficient shape for a given stage of flight. This could provide a significant boost in aircraft production, flight and maintenance efficiency. Instead of the use of separate moveable surfaces, the design incorporates a mix of tiny sub-assemblies bolted together to form an open, lightweight lattice framework covered in polymer material. The structure is comprised of thousands of tiny triangles in a strut arrangement that combines the structural stiffness of rubbery polymers and the lightness of an aerogel. During each phase of a flight, there is a different set of optimal wing parameters. Therefore a conventional wing could be viewed as a compromise that is not necessarily optimized for any of these phases. The team used the idea of an optimized, constantly deformable wing and took it a step further. They designed a system that automatically responds to changes in aerodynamic loading conditions by shifting its shape in response to particular kinds of stresses. Furthermore although the version produced for the study was hand-assembled by a team of graduate students, the repetitive process is easily replicable using simple autonomous assembly robots. This would involve a system of injecting-moulding polyethylene resin into a complex 3-D mould, producing each part in just 17 seconds according to the researchers. An international group of astrophysicists have released their observations of the giant black hole at the heart of the distant galaxy Messier 87. 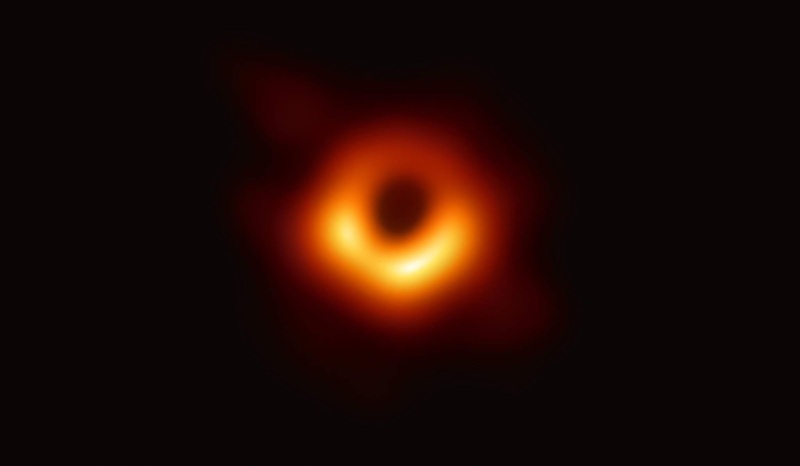 As a planet-scale array of eight ground-based radio telescopes, the Event Horizon Telescope (EHT) is an international collaboration of scientists working to capture images of a black hole. 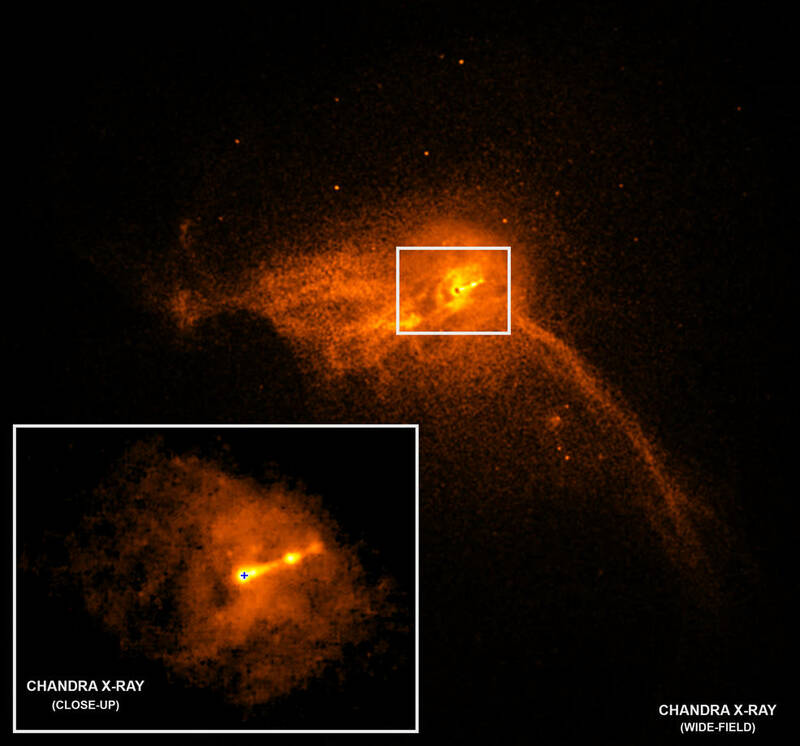 Announced in a series of six papers published in a special issue of The Astrophysical Journal Letters, the image revealed the black hole at the centre of Messier 87. This black hole is located 55 million light-years away and has a mass of about 6.5 billion Suns. Chandra X-ray Observatory close-up of the core of the M87 galaxy. The project provided a way to test for Albert Einstein's general theory of relativity during the centennial year of the historic experiment that first confirmed the theory. Tested using the motions of stars, Einstein's theory predicted the formation of dark shadow-like region caused by the gravitational bending of light. The EHT uses a technique called very-long-baseline interferometry (VLBI) to capture this image. This synchronized telescope facilities around the world and took advantage of the rotation of the Earth to form one huge, Earth-sized telescope observing at a wavelength of 1.3 mm. 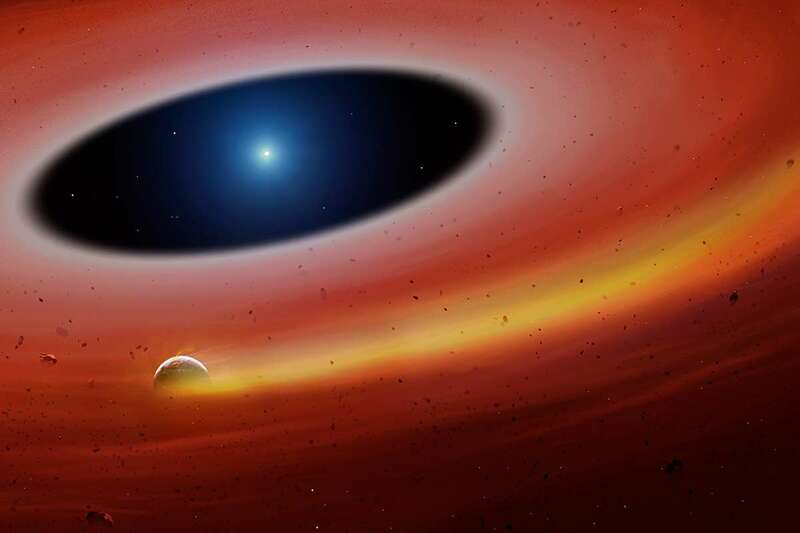 Astronomers at the University of Warwick have discovered a fragment of a planet that has survived the death of its host star. Circling over 400 light years away, astronomers detected this small body orbiting a white dwarf much closer than they would have expected. With an orbit of only two hours, the astronomers were surprised to have discovered this fragment. Believed to have once been part of a larger planet, it is believed that this fragment survived due to its composition of heavy metals. Using the Gran Telescopio Canarias in La Palma, the scientists were studying a debris disc orbiting a white dwarf that was formed by the disruption of rocky bodies made up of elements such as iron, magnesium, silicon and oxygen. Within this disc, astronomers were able to catch the fragment due to a ring of gas streaming from the body, similar to a comet's tail. It is estimated that this body is at least a kilometre in size, but it could be as large as a few hundred kilometres in diameter, comparable to some of the largest asteroids in the Solar System. "The star would have originally been about two solar masses, but now the white dwarf is only 70% of the mass of our Sun. It is also very small - roughly the size of the Earth - and this makes the star, and in general all white dwarfs, extremely dense," said lead author Dr. Christopher Manser. As reported in the Journal of Science, a new fossil site of the Cambrian period has been recently discovered by Dr. Dongjing Fu and his colleagues from Northwest University, Guizhou University, and Pomona College in China called the Qingjiang Biota. This discovery is opening up vast potential for discoveries in evolution. The Cambrian period, which was roughly 500 million years ago, had a massive explosion of life marking a critical period for the discovery of not only the first simple organism but evolution itself. Past sites have been discovered representing Cambrian periods include the Burgess Shale and Chengjiang locations, where extremely well-preserved soft bodies organisms were found. In many cases, these specimens rarely make it to general fossils, but none have the sheer quantity and quality of the newly discovered Qingjiang site. The Qingjiang site, located by the Danshui River in the Hubei province in China, includes near perfect preserved soft-bodied organisms including juvenile or larval forms, arthropod/worm cuticles, and jellyfishes. Furthermore, 53 organisms were identified as completely new to science and are still waiting to be named. 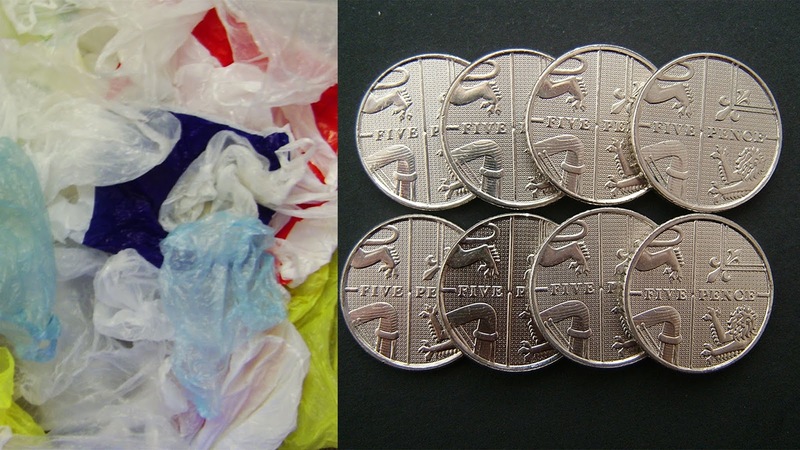 In 2015, a research project conducted in England assessed the public’s response to a mandatory five pence charge for each single-use plastic bags. The project used surveys, supermarket observations and interviews to obtain approximately five thousand data samples. It is well known that plastic waste leads to terrible consequences worldwide, such as the death of oceanic flora and fauna, negative effects on human health and environmental disasters. The data collected in England was compared to the other states of United Kingdom where the plastic bag charge already exists. Moreover, the surveys and interviews measured the change of various behaviors to assess the effectiveness of such laws. It was found that the behavior changed significantly in the majority of England’s demographics. The frequency of taking plastic bags dropped by approximately 30% and the number of people who use their own bag rose by around 20%. Moreover, the support for the bag charged increased greatly. In the light of that, policy spillover (the effect where one policy changes opinion of public on other similar policies) was investigated. In this case, it was predicted that there was no change in the policies, such as no change in increased fuel duties. This legislation brought the number of single-use bags being consumed in England close to the number seen in Wales and Scotland. In conclusion, this research found that the increased fee for the plastic bags greatly improve the environmental behavior of customers, therefore decreasing the overall consumption of plastic. Additionally, the change of opinions towards more positive didn’t spread on the bigger range of environmental policies.